HOW CAN I MAXIMIZE MY 6 DAYS IN HONGKONG? THE ONLY INCLUSIVE IN MY PACKAGE TOUR IS CITY TOUR AND 1/2 DAY IN DISNEYLAND. Hello everyone. Could anyone please help me? I'll be going to Hongkong for the first time this Dec 8 to dec 14. I wanna maximize my stay in hongkong without spending more money and wasting my time on traveling n asking for the location. Comments for HOW CAN I MAXIMIZE MY 6 DAYS IN HONGKONG? THE ONLY INCLUSIVE IN MY PACKAGE TOUR IS CITY TOUR AND 1/2 DAY IN DISNEYLAND. Re: How to get to Golden Crown Guest House from Rambler Garden Hotel? Thank you Don. We are relieved to know that we can bring our luggage to the MTR. I will be posting our itinerary on another post, looking forward to your comments/suggestions. Golden Crown Guest House is at 5/F Golden Crown Court, 66-70 Nathan Road, Tsim Sha Tsui. Right upon TST MTR Exit D1 or D2. Refer to the above post in getting to Rambler hotel to Tsing Yi MTR station --> get into the subway station and take the Tung Chung Line train and get off at Lai King station --> interchange trains to the Tsuen Wan Line and get off at Tsim Sha Tsui station (24 minutes @ HK$8.4). There's no problem bringing along your luggage inside the MTR trains. How to get to Golden Crown Guest House from Rambler Garden Hotel? Hi, we will be staying at the Rambler Garden Hotel for 2 days then transfer to Golden Crown Guest House on the 3rd day until the 5th. I would like to ask how do we get to Golden Crown Guest House from Rambler Garden Hotel? We have luggages, is it alright to bring it to the MTR? Getting to Stanley from Rambler Hotel: Take the hotel shuttle bus to the Tsing Yi MTR station. Get into the Tung Chung Line trains all the way to Hong Kong station then take Central MTR exit A. Get to the Exchange Square bus terminus and take Bus 6, 6A, 6X, 66, or 260 that will take you directly to Stanley. Re: HOW CAN I MAXIMIZE MY 6 DAYS IN HONGKONG? THE ONLY INCLUSIVE IN MY PACKAGE TOUR IS CITY TOUR AND 1/2 DAY IN DISNEYLAND. Upon getting off at Sheung Shui Railway station bus stop, nearby is the Sheung Shui MTR train station. Get into the Sheung Shui MTR station and take the East Rail Line trains heading to Lo Wu station (6 minutes @ HK$19.5) or towards Lok Ma Chau (8 minutes @ HK$19.5) for Luohu or Futian, Shenzhen respectively. Please click here to see map. Getting to The Peak (where you can watch the Wax Museum). Follow the direction above in getting to Ocean Park and upon exit at Admiralty MTR station, take a taxi to the Peak Tram terminus (10 minutes @ HK$25) and then take the Peak tram up to the Peak (7 minutes @ HK$40 for return ticket). Getting to Ngong Ping 360. Take the hotel shuttle bus to the Tsing Yi MTR station. Get into the Tung Chung Line trains heading to Tung Chung and get off on that station. Take Exit B then take a short walk to the Ngong Ping 360 Cable Car terminal. Take the cable car to Ngong Ping where you can visit the Big Buddha (25 minutes @ HK$115 for round trip ticket). Marco Polo Hotel Hong Kong is a 5-star hotel conveniently located at Harbour City, Tsim Sha Tsui, Kowloon, Hong Kong. Most hotel booking is much cheaper if made online. Try to follow the link to easily compare hotel prices. First, RAMBLER GARDEN Hotel (follow the link to read more info about the hotel and other guests reviews) is a 3-star hotel located at 1 Tsing Yi Road, Tsing Yi, Hong Kong. Here's Rambler Garden Hotel location map and nearby transportation access points. Though MTR trains is not directly accessible from the hotel (about 20 minutes walk), it does have a complimentary free shuttle bus transfer services between hotel and Tsing Yi MTR station (you may check and verify with your hotel for the shuttle bus schedule). Getting to Ocean Park (you can watch the Panda once you're inside the park). Take the hotel shuttle bus to the Tsing Yi MTR station. Get into the Tung Chung Line trains all the way to Hong Kong station then take a walk to the adjacent Central station. Get into the Island Line train and get off at Admiralty station and take Exit B (24 minutes total train travel time @ HK$11.5). Upon exit, get on the special CityBus No. 629 a special express bus that travel between Admiralty (west) and Ocean Park main entrance (15 minutes @ HK$10.6). 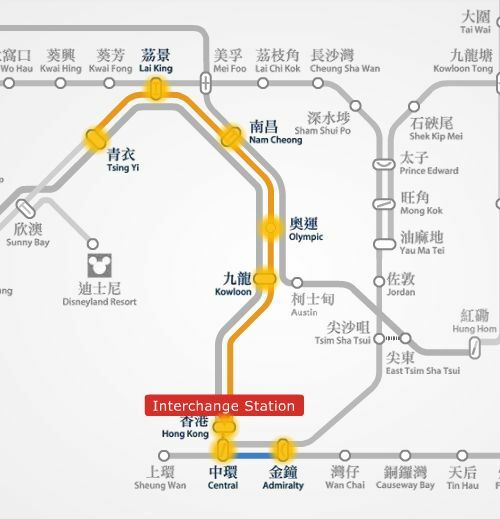 Here's the MTR route map from Tsing Yi to Admiralty station.